Pancakes, music, Lego towers, clothing, art . . . what do all these things have in common? They are things you can MAKE! Whether you sew, bake, build, invent, tinker, or play, it’s hard to deny the thrill that comes when you can exclaim, “I made that!” Here at the DMA, we whole-heartedly believe in the beauty of creativity, from the visions of the artists whose works fill our galleries to the imagination of the visitors who make the museum come to life. So why not throw a party to make merry over the joy of creativity? Activities are offered in both English and Spanish. Ver el calendario completo en español. We hope you’ll make it a date and come celebrate with us! One hour into David Byrne’s 1986 movie True Stories, John Goodman’s character, Louis Fyne, parks his car in front of the eccentric house of a voodoo practitioner. A sign reading “Invisible Hospital of Saint John the Baptist” is barely visible in the nighttime. That sign was hiding another sign that read “The Texas Kid.” The actual owner of the house with a fantastically decorated yard was Willard “The Texas Kid” Watson. Willard Watson, a.k.a. The Texas Kid, was a folk artist born in Caddo Parish, Louisiana, and raised in Dallas, Texas. 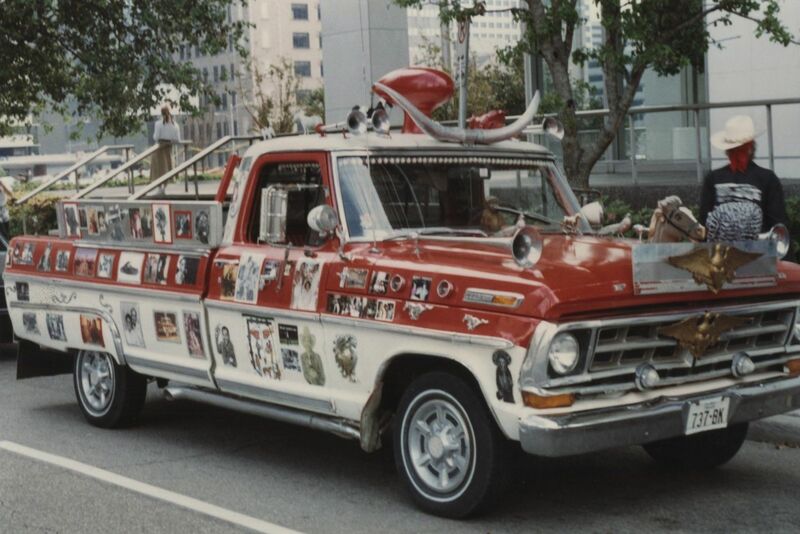 He was a local celebrity, recognized for his customized cars, flashy outfits that he sewed himself, and the sculpture garden outside his home near Love Field Airport. Fourteen of his drawings are in the DMA’s collection. The first drawings were acquired just three months after the movie was filmed. Christina Patoski, a journalist and photographer from Fort Worth, served as a special consultant for the movie. David Byrne called her in 1984, after a mutual friend recommended Patoski to be a point of contact in Texas, and said he was working on a film. In the summer of 1984, Byrne, Patoski, and some friends drove around for three days scouting locations in Dallas and surrounding counties that Byrne imagined as settings for the fictional town of Virgil, Texas. Patoski took photographs during the initial trip and throughout the filming of the movie. Patoski suggested that Byrne come back in the fall during the State Fair. He returned in October and brought Jonathan Demme, the director of Stop Making Sense. At that time, Patoski was directing a music video for Joe “King” Carrasco staged in the The Kid’s yard. They visited her there and met Watson and saw his incredible yard and home. Byrne decided to use it as a location in True Stories. Demme purchased some of Watson’s drawings and later cast him in his feature film Something Wild. While Watson himself doesn’t appear in the movie, his wife, Elnora, and one of their grandsons had roles as the wife and son of the shaman, played by Pops Staples. Patoski says they built the “voodoo room” for the movie, but the rest of the house, filled inside and out with Watson’s art, hardly had to be changed. While True Stories was filming, a solo exhibition of Watson’s art was on view at the Bath House Cultural Center at White Rock Lake. It was there that a curator from the DMA saw his Life Cycle drawings, and after showing them to the director of the DMA plans were made to acquire them. “I was really really proud for my work to be acquired by the Dallas Museum of Art,” wrote Watson. On November 29 we are partnering with KERA’s Art & Seek for a night of performances and conversation with local arts leaders Erica Fellicella, Olivia Grace Murphy, and Jerome Larez (see their full bios here). The topic: how equitable and inclusive is the Dallas arts landscape for LGBTQ+ communities? The night will kick off with each panelist sharing a selection of past work and then Art & Seek‘s Senior Arts Reporter-Producer Jerome Weeks will moderate a conversation. After the program, stick around for a meet and greet with the panelists to keep the conversation going. If you could take one work of art from the DMA home what would it be? It may be hard but don’t let that stop you. The advancement of and changes in the art scene in the Dallas community. You’ve lived in Dallas for about 20 years—how has the city changed in your perspective? If you are not scared then you are not doing it right. Is there a medium that you are interested in trying? A bigger dive into New Media-based works with stronger technology components. How do you recommend getting started with advocacy work? Show up, listen, and go. What is your hope for the LGBTQ+ communities of Dallas? More opportunity given to shine and growth as a community. Can you give us a sneak peek of what you will present at State of the Arts? Think a community speaking through the voice of one. What is something you have to do before each show? As an artist, I put a lot of importance on collaboration. I have to talk to and check in with every actor I share the stage with that night, whether it’s one other person or 100 other people. Artistically, I am looking forward to announcing our next season for Flexible Grey Theatre Company. Personally, I am looking forward to the holidays because I make (in my humble opinion) the absolute greatest pumpkin pie. What do you find most challenging or rewarding about theater as an artistic medium? The most rewarding part is getting together with a group of fellow artists who you adore and trust completely to create something wonderful. I just recently had a profound experience working on STRAIGHT at Uptown Players. The people involved and the environment were so filled with trust and love. It was an unforgettable experience as an artist. Find something you’re passionate about. Find work that needs to be done that speaks to you. And then don’t lose that spark. I want to continue to normalize queer culture, queer art, queer people, and make our community part of the fabric of why Dallas is so great. Acceptance and visibility are key, and I feel like we’re making great strides. One of my passion projects with Flexible Grey Theatre Company has been the continued work on our original piece, BRIDGES: LGBTQ+ THEN & NOW, in which interviews from the older LGBTQ+ generation are told by queer millennial performers. The audience on November 29 will have a sneak peek of this show performed by some of my favorite actors in DFW. What drives new projects for you? I hope to bring people together to share a profound experience and instill pride, belonging, interaction, and human connection. I love interacting with the students and watching them develop their art-making process. I look forward to meeting new artists and listening to their artistic processes. I especially look forward to knowing their personal stories and why they make art. Find a cause whose mission aligns with your beliefs and join. The biggest hurdle is getting involved. My hope for the LGBTQIA community of Dallas is to build greater solidarity in our voices. Too many of us are fighting the battle for equality with little support. I want to see organizations and individuals of multiple backgrounds working together. What, if anything, is missing from the arts in Dallas? For the most part, diversity, access, and inclusivity are missing. Dallas has many creative people and art should not be an afterthought because it is who we are. Art has an extraordinary power to transform attitudes, behaviors, and perceptions, especially when art is in places that are accessible to everyone. We will have a Day of the Dead fashion show with artwork that we presented in past shows from our MariconX program. Jessie Carillo is Manager of Adult Programs at the DMA. The Center for Creative Connections (C3) is thrilled to host Lauren Cross as our final artist in the 2018 Visiting Artist Project. Through her practice, Cross brings her passion and knowledge for engaging communities across the DFW Metroplex to the DMA. Her project created for C3 is no different: Assembly invites visitors to independently contribute drawings of useful and meaningful objects in their lives on 4 x 4-inch cardboard squares. Every few weeks, a selection of drawings will be installed with the goal of creating a collaborative quilt. Read this interview with the artist to learn more about her project—and stop by C3 to contribute your own drawing for the quilt! I am an artist, curator, and scholar; I am a wife, and also a mother to a beautiful, vibrant 15 month old. I was born and raised in Houston, Texas, and also spent a lot of time in both North Texas and East Texas as a child, visiting my uncles, aunts, cousins, and grandparents. Like many artists, I find that my work is both visually and contextually autobiographical. Growing up within African American families with a strong impulse for oral history and cultural tradition had an important impact on my thinking as an artist. As a result, my pull within art history and cultural discourses has often looked intently at narratives that vividly describe my personal history and influences. I am the descendant of African American quilters, carpenters, builders, creatives, and culture bearers whose legacies are often reclaimed in my work. I have always been a teaching artist who has engaged community within my work. One of my first projects after graduating was to design an arts curriculum for a local church in Dallas. Most recently, I helped develop community art projects for my nonprofit organization, WoCA Projects. This involved a partnership with ACT United, which created a photography education and exhibition project called My Fort Worth and a commission from the City of Fort Worth that collected over 2,000 visitor responses across the city about public art. In applying for the C3 Visiting Artist Project, I saw an opportunity to connect my interest in community with my interdisciplinary studio practice using brown paper bags, digital imaging, and installation. With that, I thought of my Everyday Use installation projects, which I felt connected well with the DMA’s permanent collection. I felt that those works in particular gave me an aesthetic and material language that would allow me to create a project that could speak to DMA visitors. The installation I created, called Assembly, is a project that allows me to speak to my practice, which has often referenced the cultural narratives surrounding both brown paper bags and quilts and their relationship to African American culture. I thought a lot about C3’s emphasis on objects as they relate to identity as inspiration. It seemed like a great opportunity for me to address the objects that I use and reference in my work and the narratives about identity that are connected to them: skin color, hierarchy, cultural heritage, and history. I was happy to have the opportunity to probe visitors to think about everyday objects that mean something to them in hopes that there could be wider conversations about the things that have meaning in our lives. Do you have any favorite visitor contributions you’d like to share? What have you enjoyed most about this experience so far? I have enjoyed seeing the sheer volume of thoughtful responses from visitors to the project. It has been empowering to pose a question and to get such great feedback. As an educator, it’s like teaching a subject that your students get excited about. I have also enjoyed having the opportunity to work with various museum educators throughout the project to find ways to connect visitors to the wider themes we are dealing with. What upcoming projects are you working on or excited about? I have an exciting exhibition coming up at the Cliff Gallery at Mountain View College (DCCD) from November 19 to December 14. This includes a Kitchen Table Talk with African American women artists and creatives in North Texas on Thursday, November 29, from noon to 2:00 p.m. and an artist reception on Friday, December 7, from 6:00 to 9:00 p.m. I will also have an exhibition at the Carillon Gallery at Tarrant County College South Campus in March 2019 as a result of my artist residency there this fall. Join C3 Visiting Artist Lauren Cross for a Gallery Talk on Wednesday, December 19, from 12:15 to 1:00 p.m. Gallery talks are included in free admission. For the past several years, the DMA has collaborated with the South Dallas Cultural Center during Summer at the Center, a multi-week summer camp where students learn about African history through the arts. The teens at the center visited the DMA twice this summer. Together, we traced the Middle Passage and the Atlantic Slave Trade through art in Visions of America: Three Centuries of Prints from the National Gallery of Art, unpacking responses to this period of cruelty and injustice with artists like Kara Walker, Charles White, and Elizabeth Catlett. We also explored our Arts of Africa collection, where we investigated cultures that had a visible impact on American culture. Because artists, and print-makers especially, use their work to spread ideas and messages through their art, we made prints about things that are important to us that we would like to share with the world. Here are a few highlights from the prints we made today, representing everything from music to community! Our summer partnership with the South Dallas Cultural Center is one of the highlights of our year. As an educator, it’s amazing to work with a group of students that are so knowledgeable about history – especially parts of the world that I’m still learning new things about. I think they end up teaching me a lot more than I teach them! See all of you next summer! In celebration, the greater Dallas community came together this past Saturday to enjoy Asian Festival 2017 in Fair Park. We hosted our very own art-making booth, where kids could craft their own paper scroll inspired by Enomoto Kikaku’s “Mushrooms,” a haiku poem. Check out the video below to see what we were up to! This free, family-friendly festival showcased cultural performances, arts and crafts, cuisine, and more from the many, many cultures of Asia and the Pacific Islands. Thank you to the Greater Dallas Asian American Chamber of Commerce for allowing the DMA to participate! Happy New Year! 2017 marks the fifth consecutive year that we’ll be partnering with DART on their annual DART Student Art Contest. This year’s theme is “The adventure starts here,” and what better place for students to be inspired on their own artful adventure than at the DMA! Teachers, be sure to share the news with your budding student artists–finalists will have their artwork shown at the DMA this spring! And be on the look out for our upcoming guest posts on the DART Daily blog for some around the world art inspiration!